You can imagine being one of those friends Chef Lionel Haeberle is talking to when he says, “Hey guys, come on in,” from the doorway of a beautiful home. Your taste buds anticipate his delicious four-course meal. In Chef Haeberle’s new Midpen field produced show “What’s Cooking with Lionel” the chef shares food stories that blend flavor experiences with cherished memories. Ditching his white chef uniform for jeans and a plaid shirt, Chef Haeberle welcomes TV viewers into a gleaming kitchen. Cantaloupe and Prosecco cocktail, plum cake, scallop-citrus salad, and New York steak with green beans are on the menu during the ambitious twenty-minute episode. 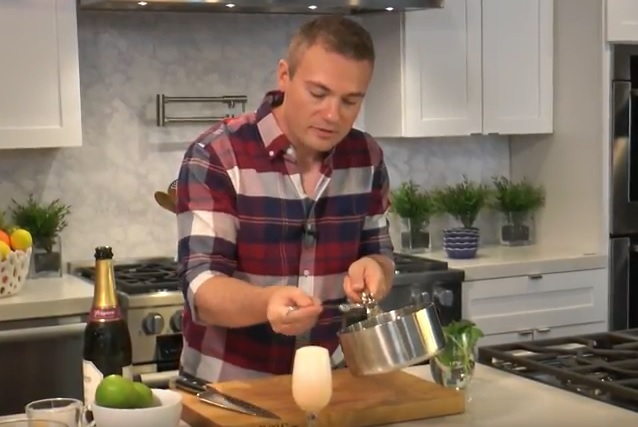 His twist on a mimosa, use of in-season fruit, and locally sourced seafood speaks to a San Francisco Bay Area audience, hungry for regional ingredients. Working with Midpen’s crew, Chef Haeberle achieved his dream of hosting his own cooking show. He says, “I’m the star of the show but I think the food is also the star of the show.” He jokes that the “Summer Dinner Party” episode took all summer to edit together. Tantalizing glimpses of upcoming dishes took hours of editing to achieve. Chef Haeberle experienced a learning curve determining camera shot placement and new video editing software. “At the end of the day, the show that you watch looks almost as good as Food Network,” he says. He notes that Midpen was able to put together a professional-level product by volunteers, compared to a quarter of a million dollars that the Food Network would spend on a similar show. Chef Haeberle is a competitive cook medaling at the “International Festival of Gastronomy” and winning “Best Chef of the Caribbean” title. During his twenty years cooking professionally, Chef Haeberle has cooked with some of the best chefs in France including the legendary Chef Paul Bocuse. If you’re planning on cooking a Valentine’s Day dinner, Chef Haeberle suggests using his summer dinner party menu with some simple ingredient swaps: substitute the cantaloupe in the cocktail for raspberry, (he notes that raspberries are very romantic) and add a little shredded ginger, which is an aphrodisiac, to the steak’s compound butter topping. The simple cuisine presented in “What’s Cooking with Lionel” tempts you to give the recipes a try. Cook along with the show or visit Chef Haeberle’s website where the recipes used in the show will be posted. More delicious shows are in production and will air on Midpen’s cable and YouTube channels, and Chef Haeberle’s website.